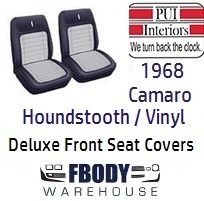 New replacement Vinyl / Hounds Tooth deluxe covers from PUI offer superior quality and fit for your early first generation 68 Camaro's front bucket seats. Seat covers are available in 3 stock factory matching colors. Use the drop down menus to select desired seat covers.